������ Nakhon Nayok is a destination which is often taken for granted by many tourists. The fact that it is located just 106 kilometers from Bangkok and its attractions may be visited as a day trip makes it just a stop over spot for travelers. But this is not always the case. Nakhon Nayok is famous for its refreshing natural beauty including waterfalls and parks, renowned historical sites, soft adventure activities, and its variety of fruits. Nakhon Nayok is one of Thailand's central provinces. Covering some 2,130 square kilometres, it borders Saraburi and Nakhon Ratchasima Provinces on the north, Prachin Buri Province on the east, Chachoengsao Province on the south and Pathum Thani Province on the west. From Bangkok: Buses leave the Bangkok's Northern Bus Terminal (Mochit 2 Bus Terminal) on Kamphaengphet Road (Tel: 02 936-3660 and 02 936-3666) every 30 minutes from 5.30 a.m. to 8.30 a.m. daily. Air-conditioned buses cost 70 bahts/single journey. Regular (non air-conditioned) buses cost 37 bahts. There are two other routes operated by transport companies: Bangkok-Hin Kong-Nakhon Nayok and Bangkok-Rangsit-Ongkharak-Nakhon Nayok. For more information, contact Tel: 0 2537 8055 and 0 2936 2841. In addition, there are also second-class air-conditioned buses operating from Bangkok-Ongkharak-Chulachomklao Royal Military Academy (by-passing the Nakhon Nayok town). For the shorter route, take Highway No. 305 (along Rangsit canal) passing Ongkharak district. The total distance is 106 kilometers. For the longer route, take Highway No. 1, turn right at Hin Kong and then drive towards Suwannason Road (Highway No. 33). The total distance is 137 kilometers. Buses to Prachin Buri, Chachoengsao, Saraburi, and Chanthaburi Provinces are available. For more information, contact the Transport Co. Ltd. Tel. 0 3731 1932. Thailand’s second largest National Park, Khao Yai National Park covers an area of 2,168 square kilometers, of which some 25% is in Nakhon Nayok Province. The remaining areas are in parts of the neighboring provinces of Saraburi, Prachin Buri and Nakhon Ratchasima. Khao Yai was listed as the first National Park in Thailand on September 18, 1962. The highest peak in Khao Yai is Yod Khao Laem, which is 1,292 meters above sea level. Khao Yai is famous for its distinct landscape dense, virgin forests, streams, waterfalls and high-altitude plains, which are a safe haven for wildlife including several mammal species such as elephants, tigers, gibbons and deer, and over 300 bird species such as giant hornbills and silver pheasants. In addition, the flora and fauna are impressive, with more than 2,500 kinds of trees, plants and flowers. Attractions in the Park include beautiful waterfalls, and jungle treks, which start in Nakhon Nayok. From Bangkok, take Don Muang-Hin Kong route, then turn left on to Highway No.33, which leads to Noen Hom Intersection. Alternatively, use the Rangsit Road and drive towards Nakhon Nayok-Noen Hom Intersection. From Noen Hom Intersection, proceed 41 kilometers to reach the Office of the National Park. From Nakhon Ratchasima, use the Mitraphap Road along Pakchong District. The total distance to the park is 81 kilometers. The Ongkharak District is well known for its ornamental plants and cut flowers. On Highway No. 305 (the Rangsit-Nakhon Nayok route), at Khlong 15, there are plenty of plant nurseries selling several kinds of plants ranging from miniature Bonsai plants to large species. Visitors to Thailand's largest plant and flower center can purchase high-quality plants and flowers at reasonable or even wholesale prices. The market extends from Khlong 15 and down to Santi Dhamma Raj Bumrung Temple (approximately 4.5 kilometers). Alternatively, visitors are welcome to shop around at the Center, which is located nearby. The Military Memorial is located in this temple, Sarika Sub-district, approximately 5 kilometers on the way to Namtok Sarika-Nang Rong (Highway No. 3050). During World War II, the 37th Quartermaster Infantry of the Japanese Military located their camp at the temple. In 1992, the Friend of Asian Alliance War Association built the memorial to honor the 7,920 Thai soldiers who were recruited to work in the camp and died in the war. Their ashes which were once placed in the temple are now put in the altar of the memorial. An additional attraction is an elaborate Buddha image which was brought here during the war from Vientiane by migrating Laotians. The Buddha image is commonly called Phra Phuttarup Pak Daeng (the red-lipped Buddha image). Please ask the abbot to see the Buddha image. Located to the south of the Park, this beautiful 3-tiered waterfall cascades from a 200-meter cliff through forested mountains onto the plains below. Its first tier is 60 meters high. The scene is breathtaking, particularly when watching the strong currents flowing from the first layer to the lower layers at a 90-degree angle before disappearing into the deep valley. The waterfall is truly spectacular and equally dangerous claiming at least one elephant death per year as wild elephants jungle path is through the waterfall. The waterfall is accessible via Route No. 3077 (Prachin Buri-Khao Yai Route). Traveling by car from the city, drive along Suwannason Road, take a left turn to Highway Number 3077 at Noen Hom intersection or Naresuan roundabout in Prachin Buri Province, and proceed to the Km. 24 marker. From Bangkok, take the Don Muang-Hin Kong route; turn left on to Highway No. 33, which leads to Noen Hom Intersection. Alternatively, use the Rangsit Road and drive towards Nakhon Nayok-Noen Hom Intersection, then switch to Highway No.3077 to Namtok Haeow Narok. By Bus: From Bangkok. There are several bus companies operating on the Bangkok-Prachin Buri route. Buses depart from the Northern Bus Terminal on Kamphaengphet 2 Road. Get off the bus at Naresuan Intersection and then hire a song taew to Khao Yai National Park. A training center for Thai military cadets, the Academy is located at the foot of Khao Cha Ngok, 14 kilometers west of the town. Apart from providing the best educational services, the compound also offers a wide range of attractions and activities. Attractions open to the public include a museum, a golf course, and a shooting range. Recently, the Boot Camp Program which allows the public to explore and experience some parts of the military exercises was initiated. Touring the Academy, which covers an area of some 3,000 rai of land, by car, is the best option. However, bicycles can be rented from the tourist centre in the Academy's compound. The most famous waterfall in Nakhon Nayok is located in Sarika Sub-district, approximately 15 kilometers east of the city along Highway No. 3050. The nine-tiered waterfall cascading down the cliff to a forested hillside has a large natural pool on each level which is sometimes is perfect for swimming. Accommodations, restaurants and souvenir shops are available. Local products including brooms and artificial flowers made from wild pine are sold in shops around the waterfall. Luang Pu Man, the famous and revered monk, had resided in nearby Sarika Cave for his religious meditation from 1917-1920. Other than Luang Pu Mans meditation place inside the cave there is also a chapel located at the top-end of the cave. In addition, there are residences of monks and nuns who pursue inner-path meditation. Getting to this picturesque waterfall is very convenient. Drive along Highway No. 3049 for about 12 kilometers, then take a left turn to Highway No. 3050 and proceed for another 3 kilometers. Located in Hin Tang Sub-district, part of the Khao Yai National Park, this multi-tiered waterfall flows down to several rock formations below and then to the lush forests. A small pool at each level makes the waterfall a perfect place for visitors to literally immerse themselves in the natural beauty. Namtok Nang Rong is located some 20 kilometers on Route No. 3049. Visitors should proceed for 7 kilometers from the Km. 12 marker of the same Highway in order to reach the waterfall. Accommodations, toilets and restaurants are available. The waterfall attracts numerous visitors during the festive seasons and long holidays. Situated in Phramani Sub-district on the way to Namtok Sarika and Namtok Nang Rong, this is a unique waterfall originating from a small stream which flows through a large rocky formation at the foot of a small hill. 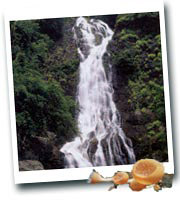 The best time to visit the waterfall is during the rainy season. To get there, take a left turn at Prachakasem intersection (about 8 kilometers on the route to the Saithong Reservoir), and then proceed for another 5 kilometers. The most honored Shrine in the city, the San Lak Mueang has been reconstructed and renovated several times. Situated near the Old City, it was once an old Shrine housing a 1-metre wooden column with a carving of a lotus at the top. In 1910, the City Pillar was enshrined at the Red Building of the Sri Nakhon Nayok School where a new four-cornered pavilion situated along Maenam Nakhon Nayok was established to house the Pillar. Inside the Shrine visitors will see one corner dedicated to Narai, a Hindu God, and another corner to a Buddhist image from the Ayutthaya period. Starting at Namtok Nang Rong, the route passes Khao Ta Mon, Namtok Nang Non, Namtok Tad Ta Mong, Namtok Tad Ta Kong, Namtok Tad Ta Phu, and Namtok Ma Now, then shifts to the Khao Yai plateau. Along the route, visitors will discover the hidden beauty of waterfalls, exotic wild orchids and forest residents such as deer, birds and monkeys. This route covers a total distance of 25 kilometers and takes 3 days/2nights to complete. Starting from Namtok Nang Rong, the route passes Khlong Wang Takhrai, Khlong Sompong Yai, proceeding along amazing hillocks and animal trails to Namtok Mae Plong. This 10-kilometer trek takes 2 days/1 night to complete. Starting from Namtok Nang Rong, the route follows the waterfall downstream to Namtok Khao Chom Long. The total distance is 10 kilometers and takes 2 days/1 night to complete. Please note that trekking reservations should be made at least a week in advance at the Tourism Authority of Thailand Nakhon Nayok Office tel: 0 3731 2284. Wang Takhrai, which is located quite close to Namtok Sarika, is a resort and a botanical garden belonging to the Chumphot - Phanthip Foundation. Wang Takhrai encompasses a total area of 1,500 rai (about 600 acres) and is renowned for its scenic landscape, small rocky creek and wide variety of plants. In addition, there is a wide range of activities awaiting visitors including swimming, riding downstream on inflated tire inner tubes, canoeing, or cycling. Camp sites and bungalow facilities are also available. Wang Takhrai is located in Hing Tang Sub-district, approximately 16 kilometers from Nakhon Nayok town. A fun, one-day trip is possible, as visitors may drive to all the attractions within the compound. Originating from Khao Yai National Park, the Nakhon Nayok River branches out at Wang Takhrai Canal. Canoe rafting trips leave from Wang Ta Krai Canal (next to Wang Ta Krai Bridge) and proceeds along Nang Rong Canal to the Nakhon Nayok River. There are many exit points along the river bank such as at Ban dong, Kaeng Sam Chan, Wang Kutapha and Wang Yao. The distance for each section is 2-5 kilometers. The river is quite smooth without rapids, but may have many unexpected (but thrilling) twists and turns. Wang Takhrai Bridge - Sam Chan Rapids: distance - 3 kms. Wang Takhrai Bridge - Wang Kutapha: distance - 4 kms. Tha Dan Bridge - Sam Chan Rapids: distance - 3 kms. Tha Dan Bridge - Wang Kutapha: distance - 4.5 kms. Wang Takhrai Bridge - Wang Yao: distance - 6.5 kms. Tha Dan Bridge - Wang Yao: distance - 6.5 kms. More complete and up-to-date information, regarding current prices and water (current) conditions, can be obtained from the TAT office in Nakhon Nayok tel: 037 312-282 and 312-284. * Trekking, please refer to section in Khao Yai National Park. Several sporting activities are available for the public. This include shooting (at a standard shooting range), canoeing, ridding on a rescue sledge (in the Academy's reservoir), and golfing in an 18-hole golf course. Group activities available are trekking, camping, and climbing either a real or an artificial cliff. Advance booking (of at least 7 days) is highly recommended. Accommodation and restaurants are available. For more information, contact the Tourist Information Centre, located in the Military Housewife Association Building, Royal Military Academy branch, from 8.00 a.m. to 4.00 p.m., tel: 0 3739 3010-5 ext. 62961-2. Getting to the Academy from Bangkok is easy. It is located in Phrommani Sub-district, just 75 kilometers from Bangkok via the Bangkok-Ongkharak route. This small waterfall cascading some 30 meters from a cliff into a basin is situated behind Wat Khao Cha-Ngok. Initially, the only painting featuring several Buddha motifs in different postures on a cliff wall facing a small hill near Khao Cha Ngok was found in a place formally called Wat Khao Cha-Ngok. In 1942, the Map Department of the Royal Thai Army decided to build a marble quarry at the foot of the hill and began restoring the paintings. Khun Dan was Nakhon Nayoks supreme administrative leader during the reign of King Naresuan the Great of the Ayutthaya Kingdom. During the war between the Kingdom and the Burmese, the Khmers took the opportunity to invade Nakhon Nayok and claim the city under its sovereignty. It was here that Khun Dan set up a camp to mobilize the people and fought back. He defeated the Khmers in 1587. The Shrine is one of the most highly respected shrines by local residents. A perfect place to learn about the history of war and its consequences, the museum displays biographies of famous graduates, history of wars, weapons of war and uniforms of soldiers of neighboring nations, as well as a wax sculpture of King Rama V. Open daily from 8.30 a.m. to 4.30 p.m. Admission fee is 10 baht. Built as a recreation area for military cadets, the Pavilion was constructed under the command of Field Marshall Crown Prince Phitsanulok Prachanat. It is also a place where a sculpture of King Rama V is enshrined. Built to honor His Majesty King Chulalongkorn (King Rama V) the founder of the Academy, the Monument is situated at the headquarters. The Monument depicts King Chulalongkorn seated in full Army regalia, bearing the Royal Insignia of the Supreme Commander of the Thai Forces.